happy holidays! i think i'll take a cue from you and try to just enjoy the next few days, sans internet (: hope you have a good christmas! sterling! this is a stunning photo ... happy holidays! and that sweet little bundle in your hands, serious cuteness overload! searching for the perfect little doggie to join our family. wish us luck. Such a cute little family you have :) Merry Christmas and enjoy your time off! This is such a great photo, a photo filled with good-looking people! 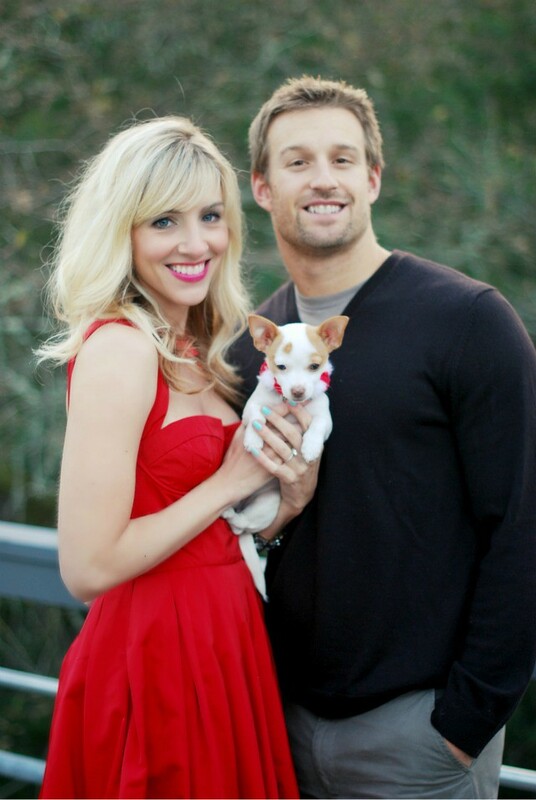 I'm loving that red dress and your cute pup!! What a gorgeous family!!! Loves a little holiday card that includes the furries!! Your dress is stunning! What a pretty picture Taylor, enjoy the holidays! So adorable Sterling! Your dress is adorable and looks wonderful on you!! You three are too cute. Plus that red dress?! Love it. Aw, how lovely! First family photo! P.S. You have amazing arms. Best ad for Cross Fit ever. Seriously, adorable!! Happy holidays to you too!! You both look like a very happy couple!! What a great picture! You guys look so festive. Have a great Holiday, and get lots of rest and relaxation with the pup! SO cute !! Enjoy your holiday ! Beautiful pic! Love the red dress! Happy holidays! You guys look great together. Happy holidays! Merry Christmas! such a beautiful couple! Merry Christmas! You make a beautiful couple! Aw! Yes this is definitely the time to spend with our loved ones! Such an adorable photo you guys all look so cute!!! Have a Very Very Happy Holiday!! I hope you have an even more successful 2012! Merry Christmas! this is such a precious photo! enjoy your down time and have a fabulous holiday! Love the red dress! Happy Holidays! Gorgeous photo, gorgeous couple, adorable little puppy! Happy holidays to you all! Lovely holiday postcard picture! Send you my best wishes for the holidays, enjoy your break! this is waaay too cute! well, that's how it should be. enjoy the time with your family and friends! happy holidays! TOO sweet. I love your dress! very cute photo! happy holidays to you guys too! beautiful picture. have a great christmas! so cute, love your red dress! nice post! I'm following this blog! Follow my blog with bloglovin, facebook, twitter and youtube if you want. Relax and enjoy your holidays! I adore this picture, you guys look great. Hope you have a great holiday week. Love the dress on you! What a gorgeous family you have! Here's to many more successes in the new year! You're so pretty and than the boy is dressed in everyday clothing - this must be an universal phenomenon. :) Boys here are just the same! Love the red dress with the sea foam green nails - cute holiday look! you look beautiful! and i love the dress! This is such a sweet photo! Hope you had a very happy holiday!